The Yorkshire moors have long been a land of mystery and imagination. The Black Meadow sits atop these moors where strange things have happened over the years. Professor Roger Mullins of the University of York spent his career studying the folklore of this place, and in August 1972 he went missing on an excursion into the Black Meadow. There is probably a reasonable and rational explanation, but that takes all the charm out of the locale. As part of the Freedom of Information Act, the archive on the Black Meadow was re-opened and piqued the interests of composer Kev Oyston (The Souless Party) and Chris Lambert. 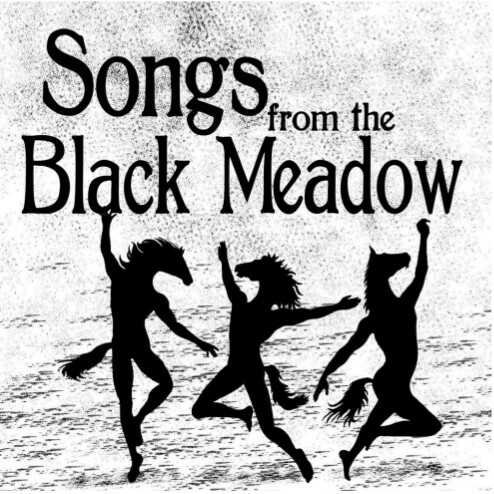 Their fascination inspired artists from around the world to further explore the Black Meadow, metaphorically through music. The result is this limited edition (150 copies) re-issue and all profits are being donated to cancer research. The fifteen tracks on this album are about evenly split between songs and instrumentals that alternate on the disc. Even though produced by a variety of artists, Chris Lambert carefully curated this collection so that all pieces present different visions that are equally eerie and I imagine convey the spookiness of the meadow. The music presented includes folk, dark folk, psych-folk, drone, a cappella chorale, acoustic, electronics, electroacoustic soundscapes, and oddly enough rap — a real mixed bag of sonic treats from artists in the USA, Greece, Scotland, and England. There is a little bit of everything here, from Eastgreen, Elena Martin, Emily Jones, The Hare and the Moon with Alison O’Donnell, The Implicit Order, Joseph Curwen, Keith Seatman, Kid Moxie, Lost Trail, Mervyn Williams and the Theale Green School Senior Choir, The Rowan Amber Mill with Angeline Morrison, Septimus Keen, The Souless Party, Winterberry, and Wyrdstone. Some of these names sound like the denizens of the moors. So if you are in the mood for some early Halloween music, check this out.